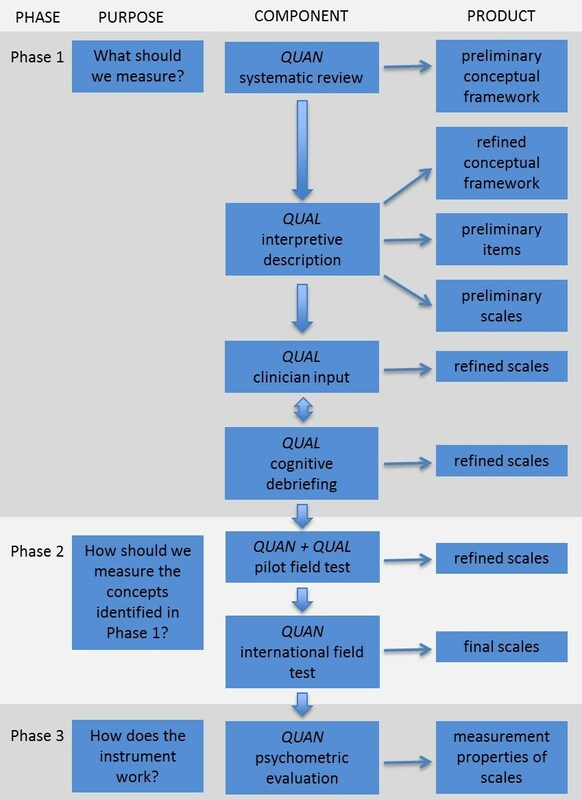 Following recent highlighting of the Q-Portfolio instruments in the US FDA’s Center for Devices and Radiological Health Strategic Priorities ‘Value and Use of Patient-Reported Outcomes (PROs) in Assessing Effects of Medical Devices’, this month we turn the spotlight on the FACE-Q©, a prime example of a PRO instrument developed using the Concept-Driven Measurement™ approach at the heart of all our work at Modus Outcomes. FACE-Q© is a PRO instrument  that measures healthcare experience and outcomes of aesthetic facial procedures from the patient’s perspective. FACE-Q© can be used to measure outcomes that matter to patients having any type of surgical or minimally invasive facial aesthetic treatment. FACE-Q© includes 4 overarching domains: Facial Appearance, Health-Related Quality of Life, Adverse Effects, and Patient Experience of Care. These domains form the basis of the FACE-Q© conceptual framework. Each domain includes multiple scales and/or checklists. Answers for each scale are summed and converted to a score from 0 to 100; higher scores indicate a better outcome. To reduce patient burden, only the subset of scales most relevant to a specific research objective or clinical patient population need be administered for a given context of use. Figure 1 shows the multiphase, mixed methods approach  used to develop Q-Portfolio instruments. FACE-Q© conceptual framework was developed from 85 qualitative interviews with facial aesthetic patients, careful examination of the research literature, and engagement with 26 healthcare professionals working with facial rejuvenation patients. 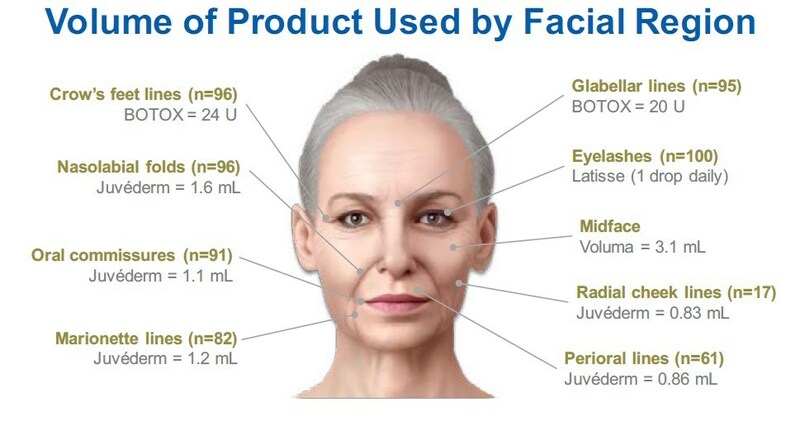 FACE-Q© has been used in 60 clinical research studies published in peer review journals and 16 clinical trials, including Allergan’s HARMONY study , a multicenter, rater-blinded, 4-month study evaluating participant satisfaction and aesthetic impact of a combination of fillers VYC-20L (Juvéderm Voluma XC), HYC-24L (Juvéderm Ultra XC), HYC-24L+ (Juvéderm Ultra Plus XC), onabotulinumtoxinA (Botox), and bimatoprost 0.3% ophthalmic solution (Latisse; Figure 2). The primary effectiveness endpoint was mean change on the FACE-Q© 10-item Satisfaction with Facial Appearance Scale, which increased from baseline (41) to month 4 (73; p < 0.00001; effect size, 2.7). FACE-Q© represents a new generation PRO instrument that was developed using a modern psychometric approach called Rasch Measurement Theory (RMT). An RMT scale can be conceptualized as a ruler, with an ordered arrangement or hierarchy of items from a low to high ‘amount’ of the construct. For example, the items of the FACE-Q© 10-item Satisfaction with Facial Appearance measure satisfaction with appearance with a set of items ranging from “…how symmetric your face looks?” to “…how your face looks under bright lights?” Being able to directly anchor the overall scores to individual items and response categories adds detailed information allowing for direct interpretation of change scores (Figure 3), which can translate into label claims. This fact, this approach, and the extensive qualitative research with patients undertaken to create FACE-Q© are what set FACE-Q© apart from other PRO instruments in the same clinical area. The FACE-Q© was developed by Dr. Stefan Cano, our own Chief Scientific Officer, together with an international research team led by Professors Andrea Pusic and Anne Klassen. For further information about how Modus Outcomes can support the use of the FACE-Q© or other Q-Portfolio instruments in current and future clinical trials, contact Andrea Murison. Pusic AL, Klassen AF, Scott AM, Cano SJ. Development and psychometric evaluation of the FACE-Q Satisfaction with Appearance Scale: A new patient-reported outcome instrument for facial aesthetics patients. Clinics in Plastic Surgery 2013;40(2):249-60. Wong Riff KW, Tsangaris E, Goodacre T, Forrest CR, Pusic AL, Cano SJ, Klassen AF. International multiphase mixed methods study protocol to develop a cross-cultural patient-reported outcome instrument for children and young adults with cleft lip and/or palate (CLEFT-Q). BMJ Open 2017;7(1):e015467. Klassen AF, Cano SJ, Pusic AL. 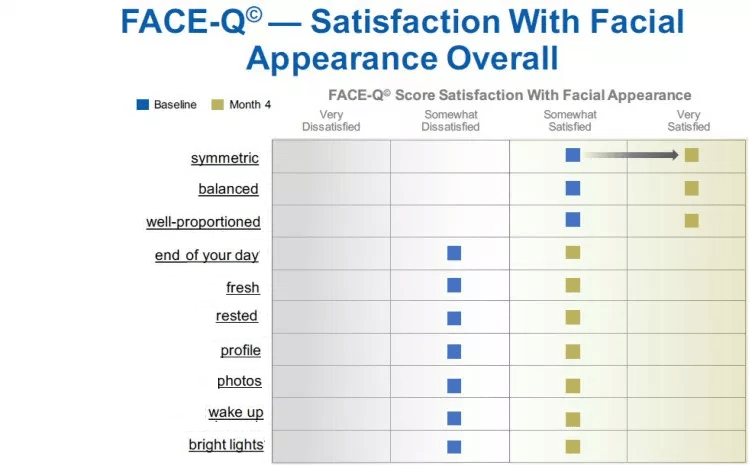 FACE-Q Satisfaction with Appearance scores from close to 1000 facial aesthetic patients. Plastic & Reconstructive Surgery 2016;137(3):651e-2e. Weinkle SH, Werschler WP, Teller CF, Sykes JM, Shamban A, Rivkin A, Narurkar VA, Kaminer MS, Dayan S, Cohen JL, Gallagher CJ. Impact of comprehensive, minimally invasive, multimodal aesthetic treatment on Satisfaction with Facial Appearance: The HARMONY study. Aesthetic Surgery Journal 2018;38(5):540-56.